I'm just sharing some thoughts on something I would really love to see happen. 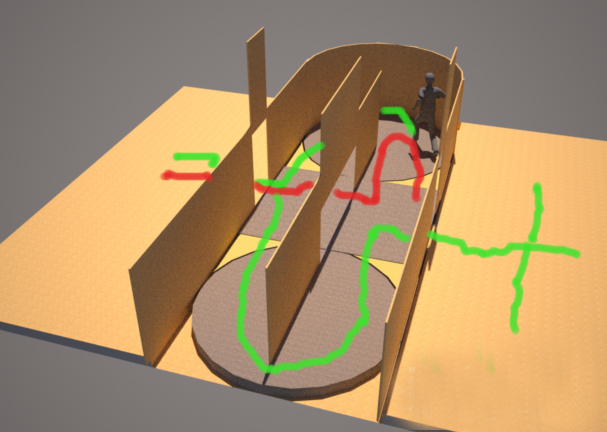 I understand all the complications involved in simulating walking around. Ive read lots of different opinions and ideas. I was toying with the idea of a claustrophobic, last stand type of game. By building a dedicated room/box out of 2x4's and plywood, square with empty window frames to have it syncronised spacewize to a game engine. The outside world would be generated by the game, and attackers would try to breach the windows and come inside. 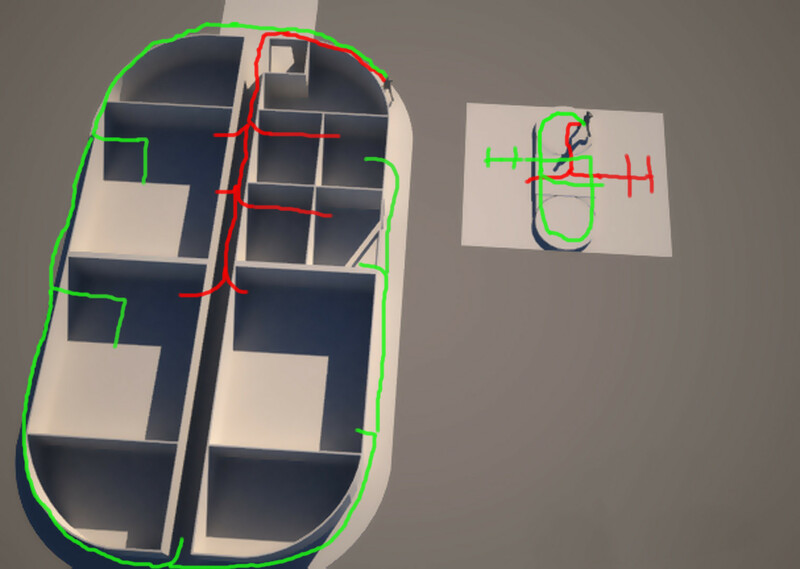 Making a model of a room exactly the same size as something ive built is fairly easy, in map editors for FPS games. And many games like the zombie games for black ops already have zombies climbing through window barriers. But I was thinking maybe you dont even have to built a room to spec. with attackers breaching your windows etc. The obvious problem is anything in the room you could knock over, and in that sense having an empty room would be ideal. Anyway, I made a render based said room design, on playstation move,and printable motion tracking markers. Playstation Move is a technology I still have not completely given up on despite varying results in terms of lag. Especially the pc-driver running the camera at 175hz(?) have seemed good to me, and I like the precision. With the accelerometers and magnetometer in the move, my impression is that the camera doesnt have to give constant feedback, but maybe just correcting and helping to prevent drifting etc. Even if its a few frames of latency, if its just correcting for drift really often, it sounds to me like the latency can be worked out. That is if the information coming from the other sensors in the wand have less lag than the camera part. The ps3 eye is not visible as its above the room in the middle looking down. I figured thats how it will be able to see the move wand in most positions and situations. The 75 degree field of view meant it had to be fairly high up to see the whole room. Sorry about the crude renders, I am no 3d-artist, but I still thought to myself I should try to contribute whatever I can. And I think this type of claustrofobic nightmare would be so cool to play. 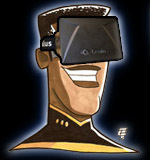 Once the tracking solution is worked out, and easy to replicate, I think that this genre of VR experience could catch on. I would like to standardize a single, empty-room tracking system, and have a bundle of games available from various developers to utilize it. Thanks for the reply, i misunderstood first and thought the thread you linked to was yours, so I posted one of my other ideas that can be implenented. I imagine hanging in a rope and feeling like you are hanging on for your life would be pretty scary. You should make your own thread about game ideas and concepts, for these type of "contained room" games or feel free to just post them here. Whatever you want, im going to try to contribute as much as I possibly can. Example I made for another thread, trying to portray how bringing markers to any enviroment could have the game engine generate graphics based on the shapes it recognizes as stairs, walls, etc. If it understands well what its rendering based on shape, it could choose textures and so on based on a theme you choose. Last edited by Namielus on Fri Oct 26, 2012 1:25 pm, edited 1 time in total. Just a simple idea: move the Move controller across the room to the corners (at initialization) and let the user create a virtual image of its room this way. Cheaper than adding markers at the stairs etc. and might work well nice if well implemented. Yes it might work, and it is simpler. Tho I would say printing out markers is also pretty cheap. I dont know how many markers are needed, and optimal placement. Ive seen software that generate 3dmodels based on multiple angles etc. without any markers at all. The markers just helt by adding high contrast, distinct points of reference. So it could work with alot of combinations. These renders are fantastic! This is pretty much the exact idea I had, but with a different technical solution. One idea I and others had (if you fancied doing some more renders ...) was a game set in a tower block like Die Hard where after clearing a level the players went back into a lift and up to the new level. In reality the lift is just a little room with doors that open and a floor that shakes a bit. After ten seconds in the "lift" the doors open on the same room again (in reality) but rendered as a new floor. For a coop game this could provide a sense of progression as opposed to a single room. You could have helicopters etc flying around outside and should be able to induce some vertigo. Okay I cant puppet the models, so I have to find some that fit the position, or make one from scratch. I think I need to find a way to puppeteer the models for me to make a good render of this, but ive made a very rough sketch based on your suggestions. and I thought up a "conveyor ladder" that lets you climb outside a window stepping off a ledge while the window closes until you reach the next one. 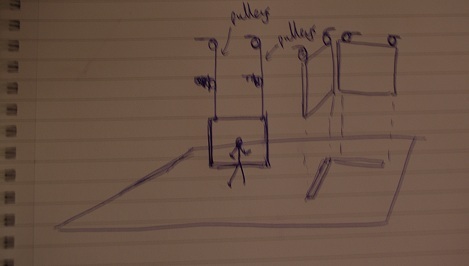 In this sketch I also added a box for the elevator, but I didnt have time to make an example of that in use yet. Sorry I just realized the picture is very long and even a big empty portion underneath but im out of time now, ill try to improve in the weekend. Does anyone remember an old TV game show called Knightmare? The players could see their 'avatar' (actually another, essentially blindfolded, player) walking around the virtual environment chroma-keyed over the physical set. Technical limitations (first aired 25 years ago!) prevented first-person views, but I could see the RIFT changing this. That show seems epic Definately something to revive when the rift comes along. plus, since most of these VR games are just floating hands in space it would be hard to navigate stairs and ladders without feet. There's hardware available that fits your needs pretty closely. You can get more information in this YouTube video. try walking up and down stairs not looking at your feet, its not so hard, as long as the stairs are located in the same place in both "worlds", you would know where to calculate your next move I think. You dont need to see your legs hitting each step, of course I might be wrong. Thanks for the link. Im on cellular now and have used up all my data. Would you be so kind to provide a link to a page with text about the same product if you have it? Otherwize I will look into it the next few days, and improving the sketch to a better render-After chrikey gets me some feedback on what he wants. Also, Im still looking into how I can puppet one model instead of finding/creating a new stiff one for each pose. It looks weird when the different poses are different models. It might work, but I wouldn't bet my nose, knees and elbows on that. Although that's not of the cheap variety. There are free alternatives, depending on your computer animation skills (makehuman + blender for example). I havent used blender before, I should consider learning that. 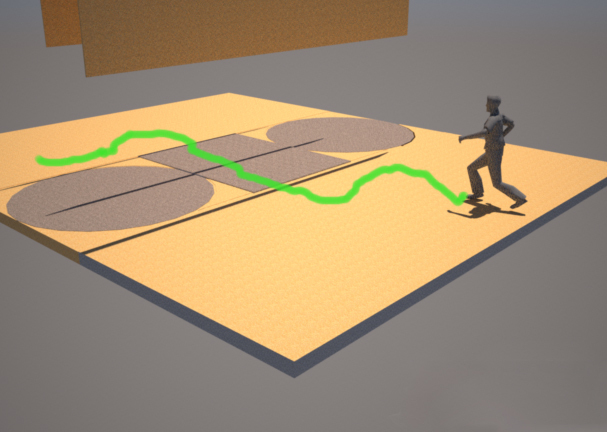 By fitting each kinect with a motor that has an un balanced weight (like a pager or controller vibration motor), each kinect sees its own IR points fine while the points from the other three kinects are blurry and do not register. 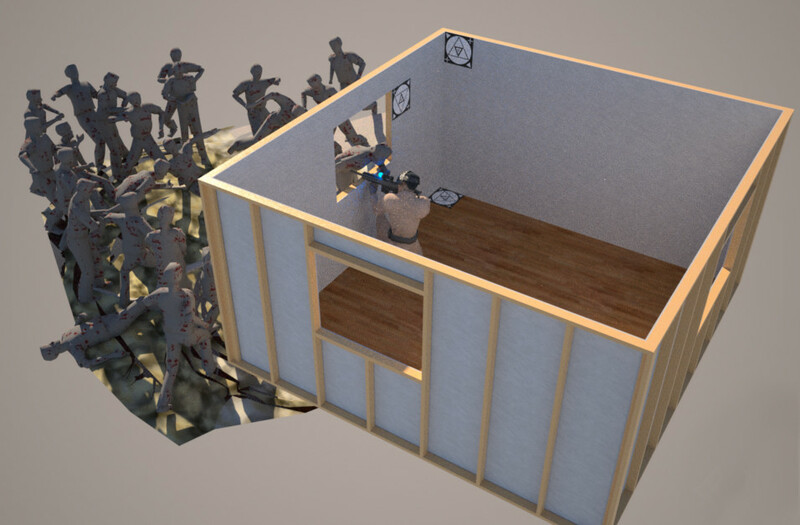 The video shows 4 kinects being used to plot a room and a person inside it. I have read that the latency on a Kinect is poor, could it be optimized? Ive posted some rumors about the kinect 2.0 that seems very viable. Hopefully we will see a new improved kinect, that has better latency. Looks great Namielus. I'm try to think of what other experiences you could do like that. The ladder climbing one is great; it would be seriously scary. It's a bit like the start of the Matrix where Neo tries to avoid the Agents in his office. During the weekend I have been going completely crazy with these ideas. Im constructing a tall office building from scratch, with floors, fully equipped rooms and a working an elevator going through all floors. The entire fasade is made out of glass, so its proving a nightmare to render. here is a proof of concept climbing-conveyor sort of thing. I will not be posting more ugly unrendered stuff, I regret posting that horrible thing. I just got overly excited lol. However, i had an even better idea, of how you can get around not being able to move sort of through space on a conveyor belt roundabout combination. A simple roundabout in each end and with a conveyor in the middle, and fairly small rooms with adjustable walls on each side. It lets you run freely through space in a much smaller real space, but all steps are 1:1. I think even tho the roundabout has a much smaller diameter circle, you wouldnt notice it that well when you are moving slowly through space by the roundabout countering your moves. It wouldnt be to complex to setup DIY with the technical knowhow I think. Its hard to explain, but I tried making a really quick drawing to show how the moves on the thing with small rooms on each side translates in the game world. Does this even make sense? Btw this is the layout of the office building im making. It scales to an infinite amount of floors. it would obviously be confined so that you feel you bump into the appropriate wall in the game, and slide open doors when appropriate. The gaps would not be so bad, could be down to a minimum of a few millimeter so you could actually lift all the walls, and run across roundabout/conveyor like its normal floor with just the elevator. In a bigger room like a basement or similar. I had a similar idea about the round-about a while back. Another cool trick that you can work into your designs is that people are really bad at dead-reckoning their turning angle. They can under-turn or over-turn a lot in the real world and not realize they are doing it. So you can play all kinds of tricks with space. Here's a cool post by Palmer about human susceptibility to scaled motion. About the climbing wall idea; I've thought of this also, but think that it's more suitable for a CAVE, so that you don't need to do any hand or foot tracking. but also potentially more complications in terms of strafing etc. design the game with narrow paths in mind. its probably been thought of already? This was one of those moments, but I guess im naive for thinking this hasnt been concidered already. I have seen some crazy crazy multi-direction threadmills, but they all have one big problem in common and that is that it restricts it to single-player. THats why Im designing my tower-block concept to fit a completely 1:1 arena as well. FingerFlinger: You might be right, but then you would still need to have the surface matched to whatever is on the conveyor/fixed wall;that being climbing fixtures ( whatever its called) or ladder steps. I cant imagine grabbing at something without having hand tracking and perfect coordination anyway. Btw, anyone else than me that hate when you think you have had an original idea, and then have to realize that its probably been thought of already? Ha! Yes, damn the Internet! It's such a humbling experience in that way. 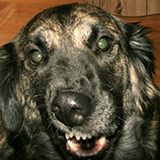 Not to mention that with all the information sharing, everybody tends to come to the same conclusions at the same time. Individuality is almost over. We're all living in the hive mind these days. Luckily in my case, the whole thought process and problem solving a big part of the fun and its rewarding on its own. Even if you never get a truly unique idea, you still know from your perspective how you got the cogwheels turning in your brain and came to a conclusion. And those "eureka" moments one gets from time to time has its own special kind of value to me.